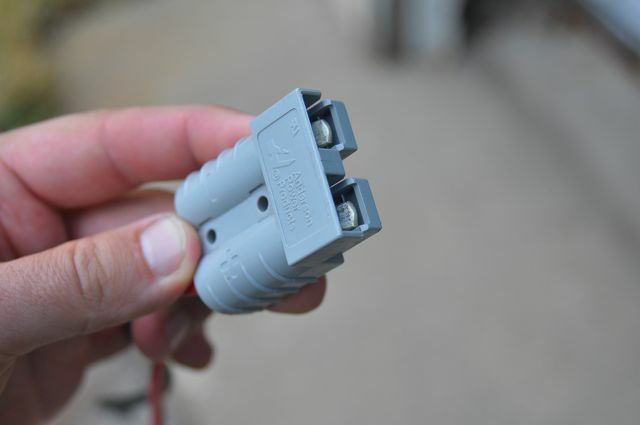 A 48V 5 Amp Charger. In my setup, the top two batteries aren’t real easy to access to connect and disconnect battery chargers to. It would be fairly easy though to PERMANENTLY leave battery chargers connected to it. Where do you want your charger to go? My original 48V charger permanently mounted on the motorcycle, under the gas tank. It’s plug was right on the frame of the cycle, and I would just plug an extension cord into it from the wall. The cycle would automatically start charging. 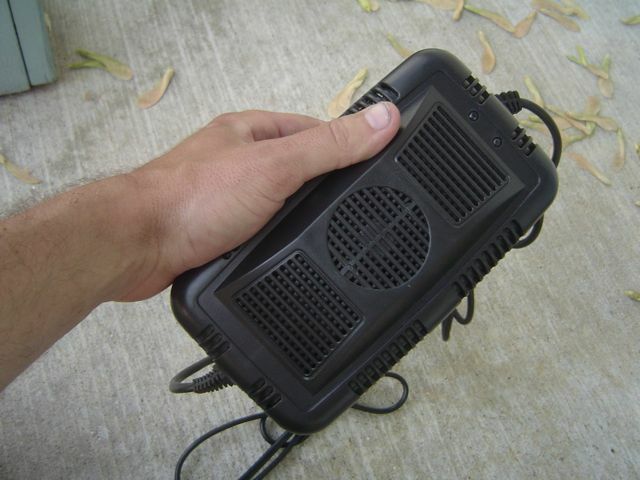 A charger that’s left always mounted to the vehicle is called an “on-board” charger. On-board chargers are always with the vehicle. If you ride over to a friend’s house, or have access to an electric outlet at work, you can ride there, plug-in, and charge the cycle the whole time you are there. Your charger is always with you. You can top off the batteries any time you want, even if they are just partly discharged, or even if you know you will only be charging for a little while. This is called “opportunity charging”, and is a good way to extend your range and keep your batteries happy. An off-board charger is NOT with you while you are out and about. That can be a good thing too. While you can’t “opportunity charge”, you also don’t have the weight of the charger, nor do you need to have the SPACE on your cycle for the charger. In addition, some chargers are rather large and heavy, and you simply wouldn’t want to try to lug one with on your motorcycle. You might also be able to get a really good price on purchasing an off-board charger. Also, an off-board charger is typically available for use on other things, such as recharging your car battery. People commonly ask how long it takes to charge an electric vehicle. Or the may ask how “big” my charger is. What they are really referring to is the rate of charge, which is measured in amps. Battery capacity is measure in amp-hours. When you want to know how long it takes to charge a battery, it depends on the capacity of the battery (and how far it is discharged) and the amp rate of the charger. The basic math is pretty simple though. Lets say that you have a battery that is rated at 100AH, and it’s half-empty. That means that you need to charge it with 50AH. If you have a charger rated at 5 amps, that will take 10 hours, or overnight. If you have a 10-amp charger, it will take 5 hours to charge, which might mean you could get a full charge while at work! Consult your battery information. Battery manufacturers provide information on the preferred rate of charge and voltage points for their batteries. Get a charger that matches what your battery manufacturer recommends. In addition, some chargers are either pre-programmed or have a specific setting for a particular type of battery. If your charger has a setting for “Flooded” and another for “AGM”, make sure you use the correct setting. For a nice, short “rule of thumb” get a charger that has an amp-rating of 1/10th the capacity (in AH – amp-hours) of the battery. Mine are rated at 55AH, so a 5 amp charger will always recharge it in 10 hours or less. I’m now using an off-board charger which is selectable between 5 and 10 amps. 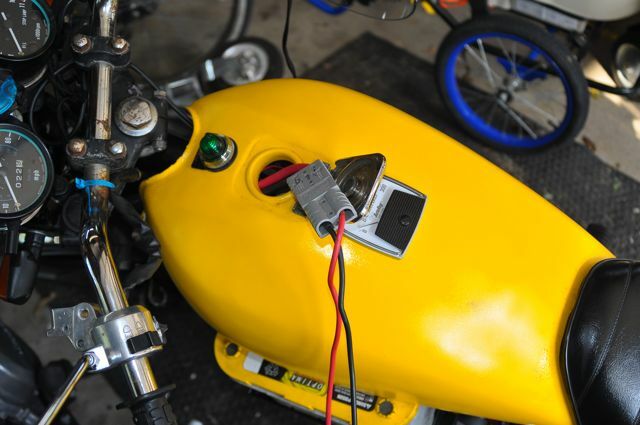 I added an Anderson connector to the battery charger and the motorcycle to make charging as easy as plugging in the connector, and flipping the charger switch to On. There are other ways to recharge batteries as well. See my “Poor-Man’s Smart Grid” for thoughts on Solar and Grid-Tied Battery Backups.